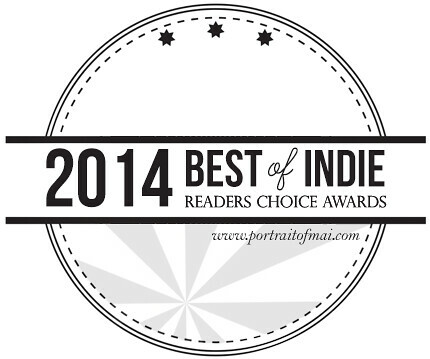 I'm so proud to announce the final results of the Best of Indie - Readers' Choice Awards Series. I'm splitting the results into two parts, Part One (this post) where I'll cover the Cosmetics categories and Part Two (the next post) where I'll cover the Bath & Body and Fragrances categories. Here is Part Two! For each brand that won, I wrote up a little blurb about them including where they ship from and if they ship internationally. If they won multiple categories, I listed the blurb once so as not to be repetitive. Also, I wanted to thank Joana for designing the badges with me! She was very patient in spite of all the changes I wanted to make. She was great to work with so feel free to check her portfolio out if you'd like to commission work from her. Click thru to see the results! Shiro Cosmetics. 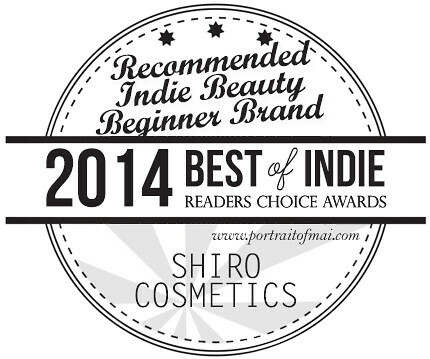 One of the quintessential brands when it comes to "geeky" cosmetics, Shiro Cosmetics (an Oregon-based brand) developed a large following for their mixture of pop culture and cosmetics. They offer loose and pressed eyeshadow, lipgloss, and tinted lip balms, along with the option to turn any of their lip safe eyeshadows into your own custom lipgloss. They do ship internationally. 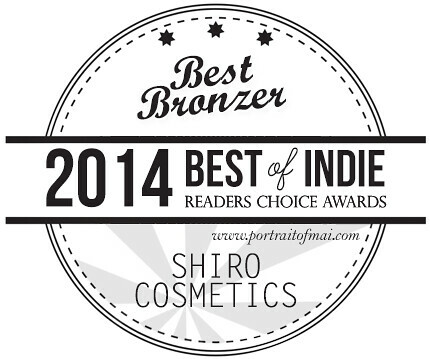 Shiro Cosmetics won with 36.9% of the votes but it was a close race with second place going to Fyrinnae with 30.9% of the vote. Femme Fatale got third place with 6.4%. 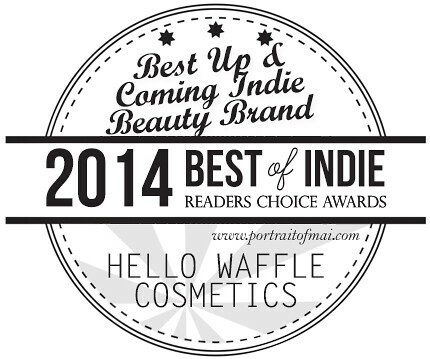 Hello Waffle Cosmetics. A brand that just had its one year birthday, Hello Waffle (named after the owner's cat's and his propensity to lurk around corners) is a Canadian-based brand offering fairytale themed eyeshadow collections. They offer loose eyeshadows, loose blushes, face powders, and lip products. If you're into cats and literature, you may like their Catssic Literature Eyeshadow Collection! They do ship internationally. 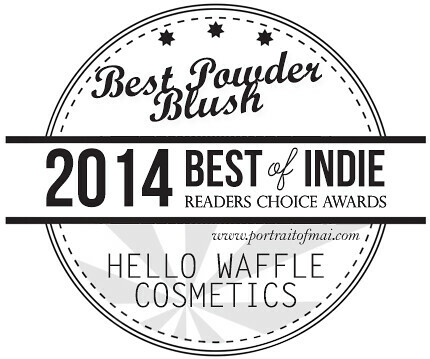 Hello Waffle won with a whopping 46.9% of the vote (dominating the category), with Life's Entropy receiving 16.4% and Baroque Cosmetics receiving 8.8%. Shiro Cosmetics. Shiro Cosmetics won with 39.9% of the vote, followed by Fyrinnae in second place with 17.3%, and Hello Waffle with 13.6%. Life's Entropy. 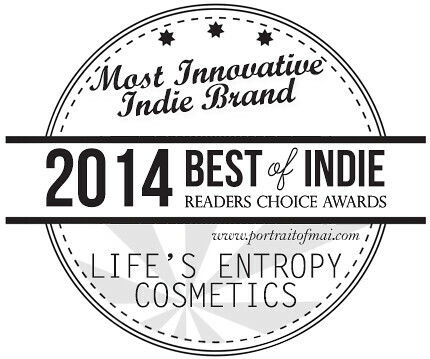 Life's Entropy, a newcomer based out of New York, has rapidly come to the forefront of indie beauty innovations. I believe they're only a few months old (opening in October I think?). Their lip theories (a take on the OCC lip tars) get a lot of love but their lip theory satin lipsticks and brow theories (a take on the Anastasia Dipbrows) are where they've exercised the best of their formulating. I highly recommend the Brow Theories and hope she releases more of the lipsticks in the future. All the products are vegan and the company ships internationally. Life's Entropy won with 33.2% of the vote, followed by Fyrinnae with 19.8%, and Darling Clandestine with 11.9%. Shiro Cosmetics. 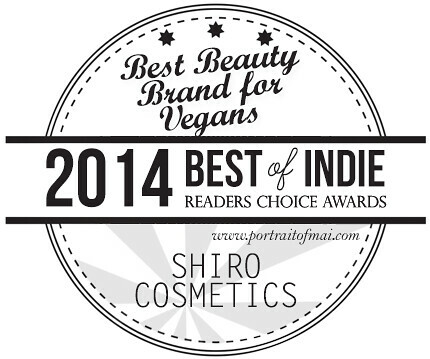 All of Shiro's products are vegan FYI! This was a close race; Shiro won with 16.4% of the vote, followed by Fyrinnae with 15.9% of the vote, then Hello Waffle with 13.3% of the vote. 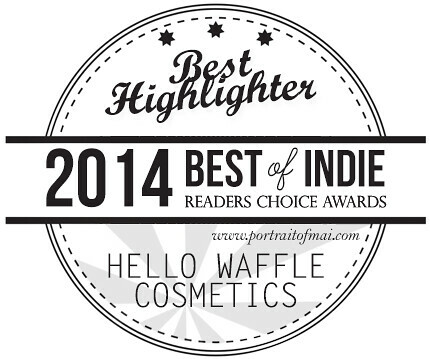 Hello Waffle Cosmetics. Hello Waffle won with 28.3% of the vote, Darling Girl took second with 10.9%, followed by My Pretty Zombie with 10%. Darling Girl Cosmetics. 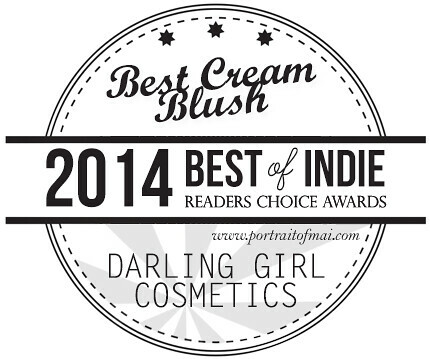 Darling Girl Cosmetics, based out of Texas, is one of my favorite brands for doing non-eyeshadow related products. They sell many items that you'd normally see sold by mainstream brands, including the cream blush that they won for. If I could only use one indie brand for the rest of my life, it'd be Darling Girl considering the wide variety of products they have. They do ship internationally. Darling Girl won with a whopping 56% of the vote, followed by Silk Naturals with 25%, and Kiss My Sass with 15.5%. Hello Waffle Cosmetics. Hello Waffle won with 28.7% of the vote, followed by Fyrinnae with 21.3%, coming up the bend is Shiro with 18%. Shiro Cosmetics. Shiro won the vote with 21.7%. We have a tie for second place with Fyrinnae Cosmetics and Meow Cosmetics at 20.8% each, and Dreamworld Hermetica rounding up third place with 8.8%. Fyrinnae Cosmetics. 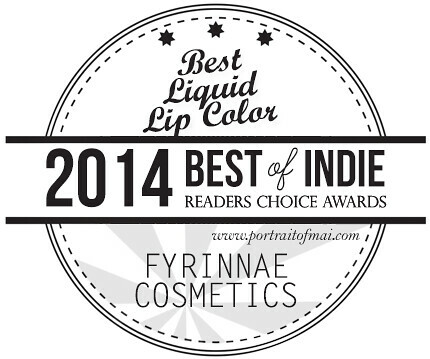 Fyrinnae Cosmetics, based out of Seattle, is one of the OGs of indie cosmetics. I remember back when they were Bombshell Bath and selling perfumes too. They're most well-known for their eyeshadows, especially their Arcane Magics which are a line of iridescent eyeshadows. Their Pixie Epoxy is also the original glitter fixative plus they've got their new line of Liquid Mattes. Don't be put off by their turn-around time, it's padded in cases of emergencies! Fyrinnae won with a big majority at 66.3%. 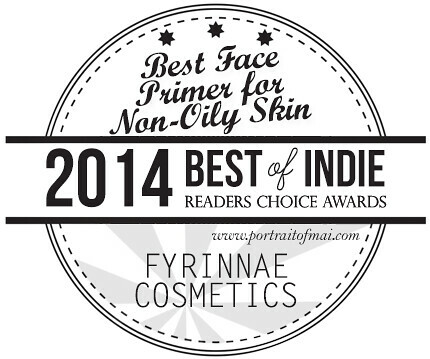 Their Powder Primer for Dry Skin is extremely unique amongst the indie beauty community so it's not surprising that Fyrinnae won. Second place went to Dreamworld Hermetica with 20.7% of the vote followed by Silk Naturals at 13%. Fyrinnae Cosmetics. Fyrinnae won again with 44.2% of the vote, Shiro took second place with 24.5% (they don't specifically sell a face primer but you can use their finishing powder as one), and Meow won with 16%. Shiro Cosmetics. Shiro won with 31.1% of the vote, followed by Fyrinnae with 30.5%, and Pumpkin and Poppy rounding out third place with 15.9% of the vote. Life's Entropy Contour Sticks. Life's Entropy Contour Sticks won with 31.7%, a win that's worth it since it's a convenient way of achieving a natural or dramatic contour. Second place goes to Pumpkin and Poppy's Contouring Powder with 24.2% of the vote, followed by Shiro's Contouring Powders at 20.7%. Meow Cosmetics. Meow Cosmetics is a cat-themed beauty brand based out of Pennsylvania. They sell eyeshadows, brow products, face powders, and of course their loose foundation. The foundation comes in three formulas based on coverage levels and fourteen (14!) different undertones. You're likely to find a color that will suit you! This company ships internationally. Meow Cosmetics won with 50.3% of the vote, followed by Dreamworld Hermetica with 29.9% of the vote, and Silk Naturals finishing with 7.8% of the vote. Meow Cosmetics. 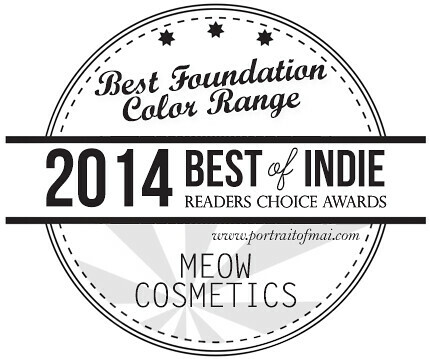 Meow Cosmetics won with 51.5% of the vote, Dreamworld Hermetica coming in second place with 28.2%, followed by Silk Naturals with 8.6% of the vote. Performance Colors Light and Smooth Foundation. Performance Colors, a brand based out of New Jersey, is a brand that I think is generally underrated by the indie community. Although they won for their Cream Foundation, their lipsticks are worth a scope at especially since they're so inexpensive yet have great pigmentation and a wide color range. Unfortunately, it appears that they have closed their business. I'm not sure whether they will reopen again in the near future. Performance Colors Light and Smooth Foundation won with the majority of votes, 51.9%, followed by Silk Naturals HD Foundation with 41.1%, followed by Glory Boon Liquid Foundation with 7%. Meow Cosmetics. Meow Cosmetics won with the majority of votes, receiving 57.6% of the vote, followed by Dreamworld Hermetica with 32.7%, followed by Silk Naturals with 5.4% of the vote. Shiro Cosmetics Seven Kingdoms Collection. The Seven Kingdoms Collection won with 26.4% of the vote, followed by Hello Waffle's Catssic Literature collection with 16.4% of the vote, and Femme Fatale's Post-Apocalyptic rounding out with 10.1% of the vote. Femme Fatale Cosmetics. Femme Fatale is an Australian-based brand that sells some astounding duo chrome eyeshadows (which obviously they won for). The duo chrome shift is so good, you have to wonder what kind of magic they're instilling into the eyeshadows. They also have a drool-worthy line of nail polishes and are also a great source for Australians seeking indie nail polishes and other cosmetics lines. The company ships internationally. This was an extremely close race! 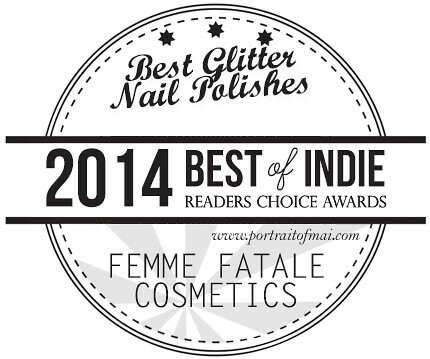 Femme Fatale won with 34.8% of the vote, followed by Fyrinnae with 34.5% (a difference of only one vote! ), with Shiro rounding out third with 7.4% of the vote. Blackbird Cosmetics. 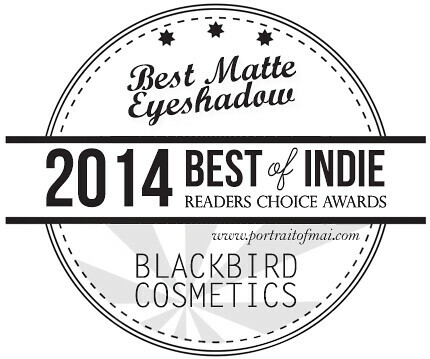 Blackbird Cosmetics, based out of Ohio, is admittedly a new brand to me and I'm not that familiar with them. However what is apparent is that their repertoire consists of matte eyeshadows, finishing powders, and contouring powders (all of which are mattes). It's a little refreshing to see though, especially when one can get overwhelmed by all the sparkly and shiny offerings available. Matte is what they seem to do best! They do ship internationally. 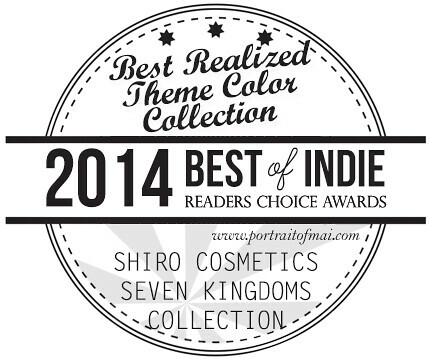 Blackbird Cosmetics won with 54% of the vote, Detrivore came in second with 18.1%, and Shiro in third with 7.7%. Darling Girl Primped and Primed Eyelid Primer. Darling Girl Primped and Primed Eyelid Primer won with 41.8% of the vote, Performance Colors Shadow Magnet came in second with 29.1%, and Glamour Doll Eyes Control Freak came in third with 14.3% of the vote. Fyrinnae Pixie Epoxy. Fyrinnae Pixie Epoxy won with 67% of the vote (I meant it when I said Fyrinnae is the originator of the glitter fixative!) 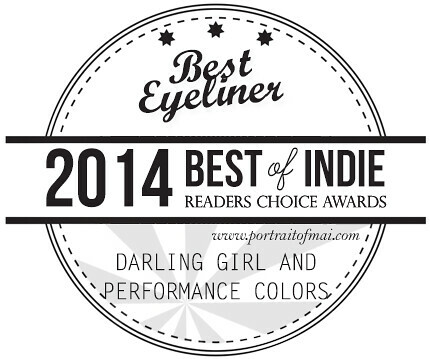 , Darling Girl Glitter Glue came in second with 26.3%, and Glamour Doll Eyes Glitter Fix finished with 6.7% of the vote. Darling Girl In Living Color Shadow Base. 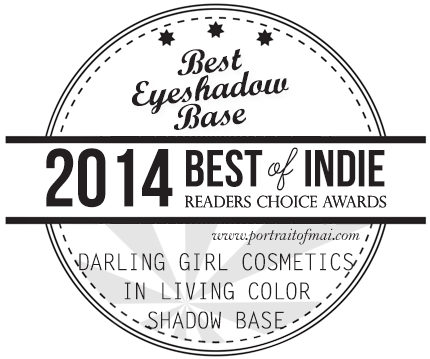 Darling Girl In Living Color Shadow Base won with 64.7% of the vote, Kiss My Sass Eyepoxy Cream Base came in second with 25% of the vote, followed by Lunatick Cosmetic Labs Eyeshadow Base with 10.3%. Darling Girl Pixie Sprinkles. Darling Girl Pixie Sprinkles won with 49.5% of the vote, followed by Glamour Doll Eyes with 19.8%, and Victorian Disco with 17.8%. Darling Girl Watercolor Paint Pots and Performance Colors Shimmersticks. Unfortunately both don't appear to be available for sale right now. 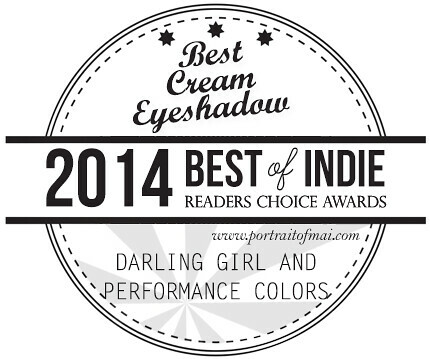 Darling Girl Watercolor Paint Pots and Performance Colors Shimmersticks tied with 37.3% of the vote, followed by Pumpkin and Poppy Cream Eyeshadow with 15.5%, and Kiss My Sass Cream Eyeshadow with 9.9%. Shiro Cosmetics Pressed Eyeshadows. This was a close race! 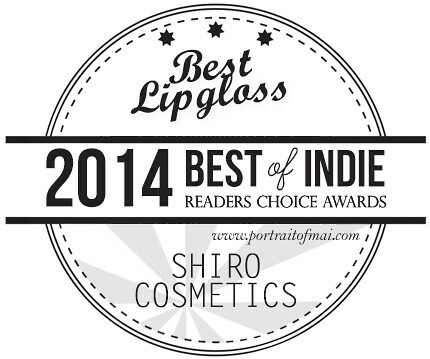 Shiro won with 27.6% of the vote, followed by Fyrinnae with 27.1% (one vote made the difference! ), followed by Hello Waffle with 22.7%. Life's Entropy Brow Theories. 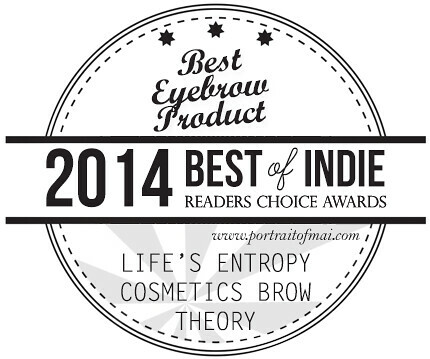 Life’s Entropy Brow Theories dominated the category with 70.5%, followed by Silk Naturals Brow Cream with 12.1%, and Chinovi Brow Powder got 9.8%. Ten Three Labs Salve Sticks. Ten Three Labs is another new to me company. Obviously they are probably most well-known for their salve sticks and smudge sticks (tinted version of the salve sticks) but they also sell perfumes and eyeshadows. If you like Bob's Burgers, they have a new eyeshadow collection based off the show and recently released an Orphan Black collection. I've yet to get a Salve Stick but I'm sure I'll be making a purchase soon! They do ship internationally. 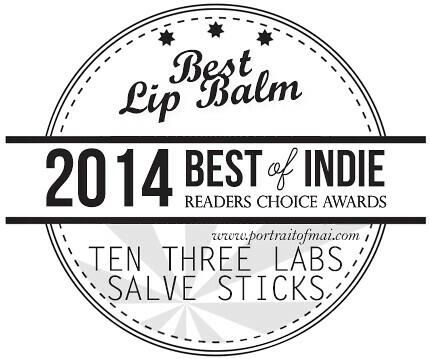 Ten Three Labs Salve Sticks won with 30.1% of the vote, followed by Haus of Gloi Lip Balms with 19.7%, and Notoriously Morbid Coffin Kissers with 15% of the vote. 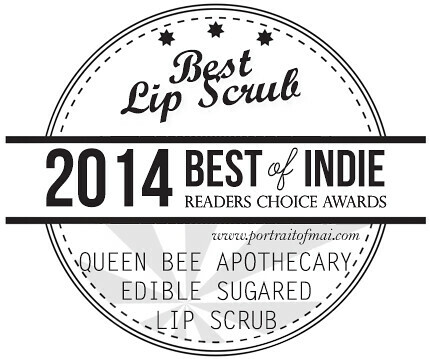 Queen Bee Apothecary Edible Sugared Lip Scrub. Queen Bee Apothecary is another new to me company. They have a broad variety of bath and body and fragrance products, along with lip care items (like their lip scrub). Their line also includes a line of men's products (if you're looking to get something for yourself or a significant other). They do ship internationally but you must contact them first about it. Performance Colors. Performance Colors won with 43.4% of the vote, followed by Life’s Entropy with 23.4%, and Silk Naturals with 9%. I'm sorry that the top two winners aren't currently offering lipsticks. However, I would highly recommend checking out Silk Naturals, they have a great variety for an economical price! Limnit Lipsticks. Limnit Lipsticks has developed a great reputation for their unusual lipstick colors. There is a great variety of shades that are outside of the typical spectrum, but aren't too bright for daily wear. Currently, they're only offering lipsticks in jars while they work out an issue with their lipstick bullets, but they'll be back soon! The lipsticks are vegan. They do ship internationally. 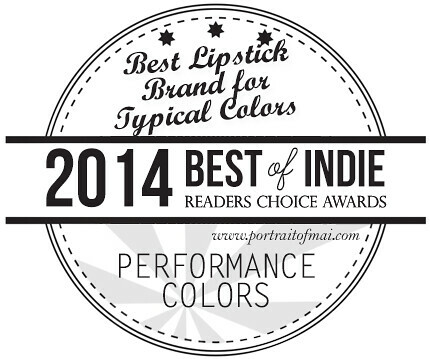 Limnit Lipsticks won with 37.6% of the vote, followed by Portland Black with 17.8%, and Fierce Magenta with 11.9%. Fyrinnae Cosmetics. Fyrinnae make both their lip lustres and liquid matte lipstick and both are worth a try! Fyrinnae won with 57.7% of the vote, followed by Life’s Entropy with 33.3%, and lastly Pretty Zombie Cosmetics with 3.4%. Shiro Cosmetics. Shiro was the overwhelming winner with 72.6%, followed by Notoriously Morbid with 10.7%, and Fierce Magenta with 7.4%. Shiro does offer a custom lipgloss option if you're not a fan of the current lipgloss lineup. Femme Fatale Cosmetics. Femme Fatale won with 32% of the vote, followed by A-England with 25%, and ILNP with 12.5%. 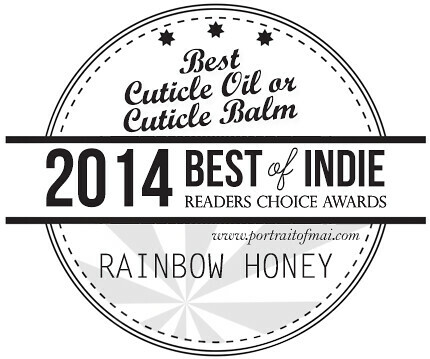 Rainbow Honey Cuticle Oil and Cuticle Balm. Their shop isn't currently open but the brand is famous for their Mystery Bag (a monthly subscription box where you can get a set of nail polish and hand care products) and their glitter filled nail polishes. I haven't tried them myself but I know Phyrra loves them! Rainbow Honey won with 35.7% of the vote, followed by KBShimmer with 15.5%, then a tie with Epically Epic and Fortune Cookie Soaps at 14.3%. I hope you enjoyed reading all the winners. Feel free to check out each shop and tell me if you decide to get anything! Thanks for putting this together! looks like a lot of time went into it! This is great so many companies I love, plus some that I haven't tried out yet. I love it.